due to recent events this special edition of the newsletter Tango-DJ.at is published. If the newsletter is not displayed correctly you might consider reading the online version. "Plagiarism is the highest form of flattery." (Oscar Wilde) Still it is difficult to accept when confronted with such a situation for the first time - at least for me. Last weekend in Cologne I came across a CD-R compilation which was described to me as a collection of very special tangos ready compiled in tandas. After taking a look at the presented tangos I was quite surprised since it was a collection of rare and special tangos indeed. Strangely all of them seemed to be familiar to me..
Lots of these CDs are very rare and hard to get. It took and it takes a lot of work, time and money in order to find those CDs, get hold of them, publish information about it and to try to make them available also for others. Only with the support of people by buying CDs it is possible to keep up the work and find more of those rare recordings, the CDs containing them and publishing information about it. If you have some interest in those special tango recordings you have to understand that someone has to spend lots of time, work and money in order to find 78rpms. It takes lots of know how, time, work and money to transfer this and produce high quality CDs. And it takes people to find those and make them available to you. All of this is only possible if you are willing to pay for your music. If you offer your service as a Tango-DJ, pay for the music you are working with! 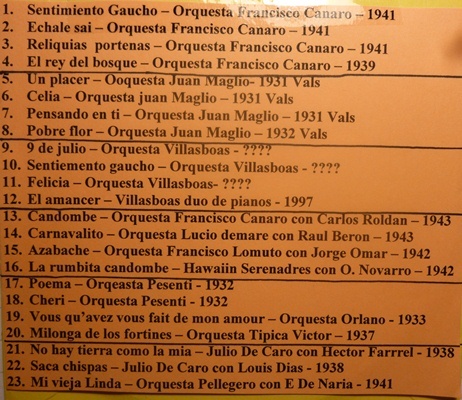 maybe you want to make yourself a present - buy yourself some tango CDs..